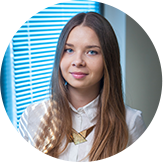 Home / Blog / IT Staffing / How Much Does It Cost to Hire a CSS Developer in Ukraine? CSS is a definitely familiar term if you are in the sphere of information technologies and deal with the product development and coding languages. As a start-uper or business owner will encounter these terms quite often regarding the visual implementation of your project. Most likely you will be looking to hire CSS developer to work on the visual appearance of your product. HTML (Hyper Text Markup Language) is about the content of a website or web app, while CSS (Cascading Style Sheets) is about the picture you see, so these work closely together, that’s why HTML CSS programmers are always skilled and proficient at both. CSS is a language for the style, specifications, layout and other documents are presented to regular users, as MDN describes it. A CSS coder is a developer dealing with front-end in general. The markup language that is most often used for structuring the CSS document is HTML, so CSS and HTML are closely connected. Other languages that you can encounter are XML or SVG. Writing a good semantic markup is an important practice for CSS and HTML. It means an HTML CSS coder should use meaningful CSS class names and appropriate HTML tags to keep the structural meaning. Proper naming conventions is another good practice for CSS. There are various naming conventions like ACSS, OOCSS, SMACSS, BEM etc. CSS should be reset, because of small styling inconsistencies of various browsers. Cross browser support is also required, so your code could support most of the modern browsers. In order to work properly on various browsers, some CSS properties require vendor prefixes. Key CSS preprocessors are SASS and LESS, they add inheritance, mixins, variables. After CSS had been compiled by preprocessor, CSS postprocessors apply changes to it. You can stack elements vertically and horizontally due to grid systems. They form grid frameworks like Skeleton or Bootstrap that help a website to be more responsive. CSS media queries also help to reach responsiveness. 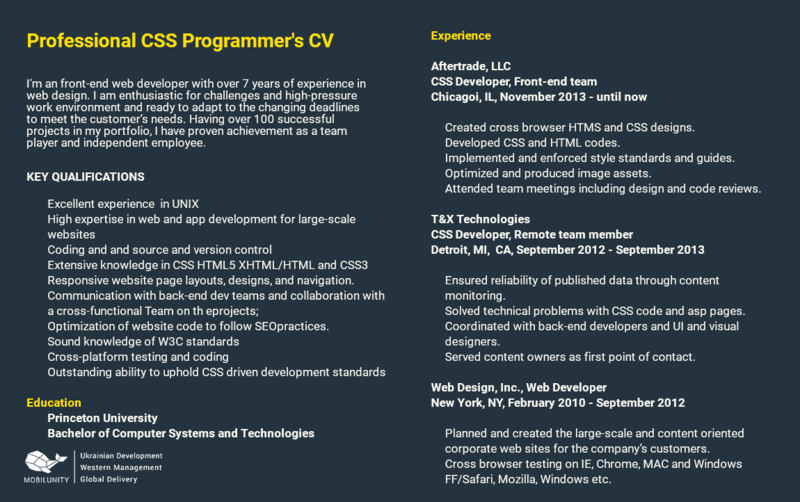 A HTML CSS developer resume should include information about the experience, skills, samples of his work. CSS devs in US make annually $59,773 on average, according to PayScale. CSS developer salary in Italy is approximately $23,000 per year, while front-end engineer with CSS skills earns approximately $39,000. In UK a developer with CSS skills earns $31,500 per year, and front-end engineers annually make $37,500. $42,500 is a median salary of a coder in Germany, German front-end engineer earns $51,000 per year. 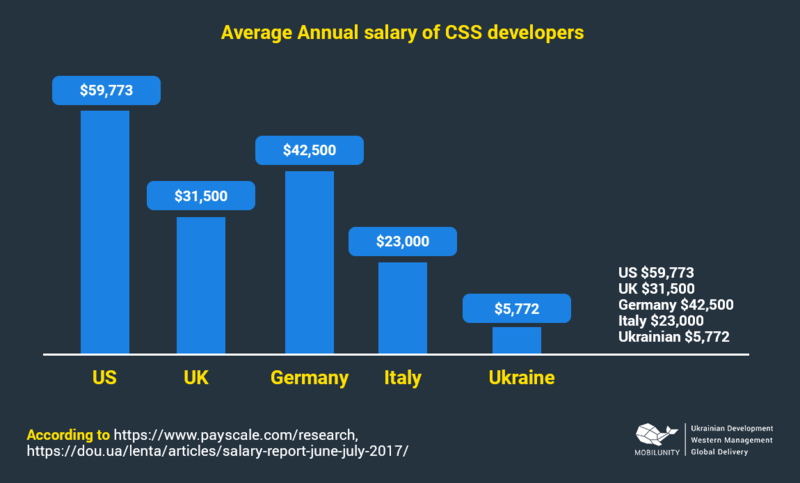 DOU informs, that the cost of CSS developer in Ukraine is $5,772 annually, which means that the monthly salary rate of CSS coder $480. Of course, web coders from Kiev have a little higher salaries, $6,000 annually and $500 monthly. PayScale provides information that the PHP front-end engineer’s median annual salary is $22,800. According to Medium, it is better to hire CSS developer remotely as a member of the developer team. You can hire a dedicated dev team at outstaffing companies, Mobilunity being one of the most effective. You will get competent project management that will minimize your risks. Mobilunity was founded in 2010 and since then provides dedicated teams and IT outsourcing solutions to different countries around the world. As on October end, we have 4 teams working on Swiss projects and 3 teams for our German clients. Our dedicated developers also work for such countries as Canada, USA, Denmark, France, Israel and Luxembourg. Every month Mobilunity gets approximately 10-15 requests for different businesses worldwide. Mobilunity will be glad to help you out with any technical issue no matter where you are from. Being a provider of dedicated developers for 7 years, it is obvious Mobilunity has a huge package of experience in hiring professionals in no time. It takes us to find and test a perfect programmer in 2-4 weeks depending on the complexity of your project. Let us know your problem and we will find a perfect solution to it! Hire the most experienced CSS developers at Mobilunity to ensure your project will have the most relevant, up-to-date visual part.